We are a small independent church situated in Westcliff-on-Sea (Essex), a very densely populated part of the Borough of Southend-on-Sea. Although we started as an Open Brethren Assembly, we have gradually "morphed" into a church that, whilst retaining some customs and practices of the Brethren, has also adopted some more modern innovations. We are not formally linked to any denomination, but are members of the Chalkwell Group of Churches (a local neighbourhood grouping under Churches Together in Southend) and are fully involved in Love Southend (a cross-Borough initiative drawing together some of the churches in Southend). We are self-governing - our Leadership Team currently comprises 6 people - and self-financing. 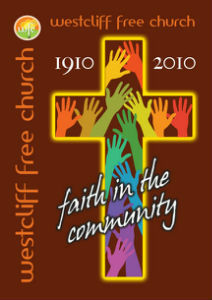 The church is now a charity with its own trustees, and is also a company limited by guarantee. The building is currently owned by a small group of Trustees (2 of whom are members of the church) who operate under a Trust Deed; they are in the process of handing it over to the church trustees. Our Basis of Faith is based on that of the Evangelical Alliance. We have published a number of leaflets to explain the way we do things; these are available at the church.